This flash dryer was a supporting universal device for the single rotary,double rotary screen press produced by our company.it was compatible with all the multi color screen press produced by our company since 2016.just take domn one set of the screen frame arm on the press,then you can add this dryer on the press to work.after installation,the original 4 color over printing will turn to 3 color;6 color screen press will turn to 5 color.if you do not need to dry,just restore the screen frame arm back to it's position. After add the dryer on the multi color screen press,when print one color,turn the dryer to the workstation,flash dryer a few seconds,when the substrate surface was dried,and do not stick to the screen,turn away the dryer and printing next door...it will reduce the drying time,improve work efficiency,lower work intensity. This dryer is special designed for my company's production of various single wheel and double wheel overprint screen printing machine . This dryer is universal for all multi-color overprint screen printing machine since 2016 year. Just take down one frame arm of the screen printing machine, then the dryer can be installed in screen printing machine . The original four color machine can print only three color after refit; and the original six color machine can print only five color after refit. If you don't need drying function, just need to reinstall the original frame arm. 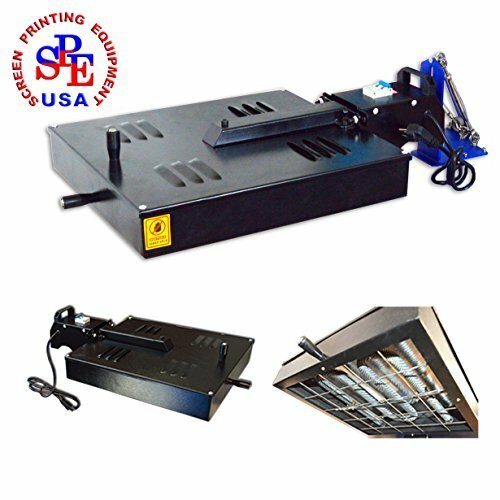 When multi-color overprint screen printing machine equipped with a dryer, we can rotate the dryer to the operation pallet to flash dry several seconds after a color printing, then the second color and so on ,to reduce the drying time ,improve the work efficiency and reduce working intensity. If you have any questions about this product by Screen Printing Auxiliary Equipment, contact us by completing and submitting the form below. If you are looking for a specif part number, please include it with your message.